tomofNV wrote: The 30A outlets I used to charge at RV parks 5-9 years ago in my converted car were 240V, verified by my energy meter which reads out AC voltage, current, power, and accumulated energy. I don't know much about RVs themselves. Are you sure these were not 50 Amp outlets? 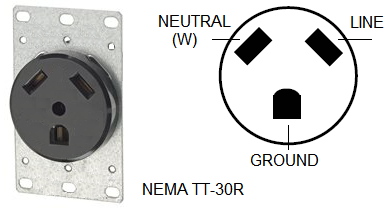 Almost all RVs use TT-30 or NEMA_14-50. Three connectors: Hot, neutral and ground. 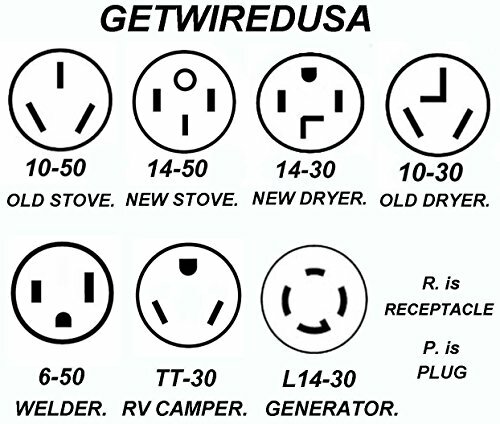 Most RVs are wired for 120V 30 Amp. 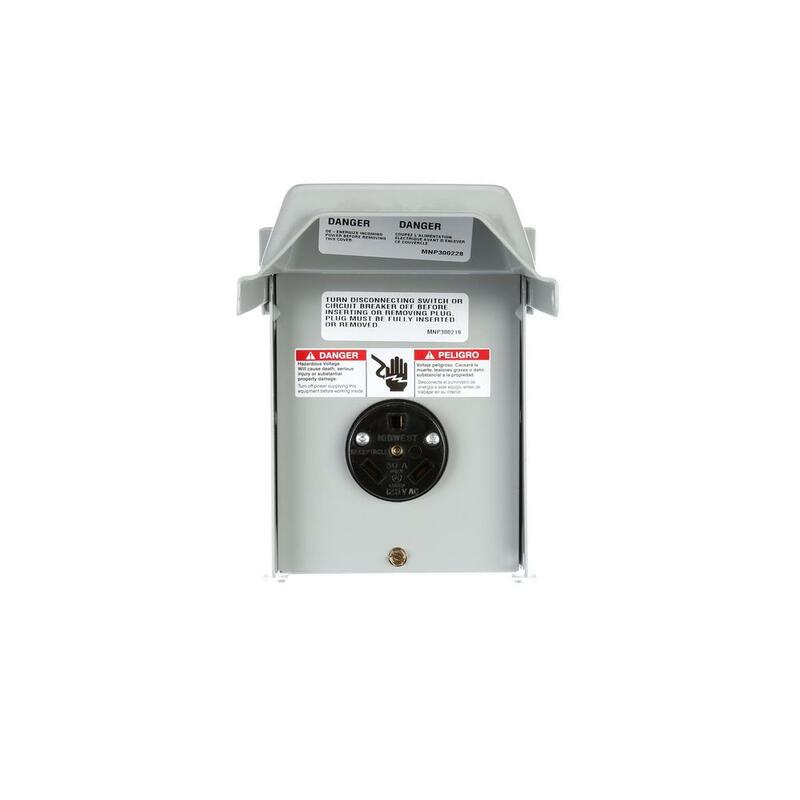 Large RVs use 240V 50A. 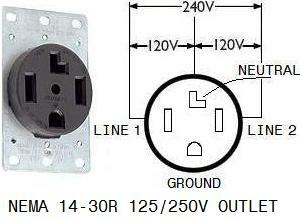 Four connectors: Hot phase x, Hot phase y, neutral and ground. Note that you should never exceed 80% of 'rated' amps, so a max of 24 amp constant load on this one. These are found in some garages. Note that you should never exceed 80% of 'rated' amps, so a max of 24 amp EVSE on this one. 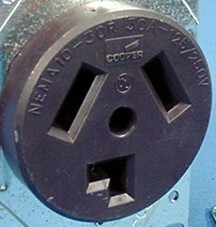 I usually used a 50A site, NEMA 14-50, but a few times those were all taken so I used a 30A site, and it was 240 VAC. Maybe not common, dunno. Only used one at one RV park. Slightly off topic question: I read on another website that the US stock EVSE can be operate safely on 240 v, with a proper plug adapter, delivering 12 amp at 240 v for double the charge rate (not Level 2, but faster than 120 v). That makes sense to me, BUT the nameplate only says 120 v. That is, of course, true with the stock plug. Does anyone have an official Chevy reference that says 240 v is OK? There is no "official GM reference" for it, but it does work. Several people here have used it so (with a "converter pigtail"). If you look through the site, you should quickly find a description of how it works (and maybe why). Search for 'pigtail'. I do understand that they are not specifically referring to the EVSE Chevrolet ships. Correct. They are in the business of removing and replacing the input cord, and would like to protect that business. In addition, as you point out, they are discussing a circa 2011 Nissan EVSE, which I have not seen the internals of. 2) GM desired a single part number PCB that could be sold worldwide and used from 90-265VAC. 4) Many folks have made or purchased "pigtail" adapters and are currently using them. Although removing the cord and replacing it is an option, I am not crazy about that as there is no indication they use a thermal sensor in the new cord to detect overheating, caused by a bad connection. The best solution would have been for GM to have put a 220V plug on the included EVSE and also included a 120V plug adapter, IMHO. It would have been great if they had equipped it with replaceable plugs as Tesla does, or at least a 240 v plug and provide a pigtail for 120. One thing I have not found is the actual wiring for the four contacts of, say, a Nema 14-50 to the three pins of the 120 v plug. I should be able to guess, but guessing is a good way to ruin it. I just completed the task of making a pigtail for 14-50 to 3 pin 120v. I thought I'd do it the 'easy way' and buy a pre-made oven plug. That was a mistake. The oven plug uses #8 wire and I failed to realize that I don't need #8 wire on the pigtail. At least not on a pigtail that is for 220v in my house that is going to connect to the portable charger that came with the Bolt. Since the portable charger maxes out at 12a then you should be able to use #10 wire and that would have fit very well into the 3 pin socket I used. So the #8 wire did not connect very easily to the 120v 3 pin 20a socket I attached. You don't need the neutral for the connection. Connect the ground and 2 hots. And if you look at the product I referenced above you will see the neutral prong missing in the photo.